For the Iprona AG, Ruland realised the project "equipping of a newly built facility with process systems". This project was implemented in two phases: consulting and realisation. After years of strong growth, in 2005 building a new production facility in Lana, Italy, was begun. To find out which course of action would be best for the project, our customer decided on a consulting. Phase one was the planning of a rough concept, which was to form the basis for the detailed concept/engineering of phase two. We started by recording the current methods of production and generated a block diagram which shows the complete flow of materials, from raw goods reception/storage up to the production lines for the finished products. The snapshot of the current situation and the talks about the details were from the start done together with the Iprona project team. This includes the facility/project leaders as well as members of the technical department, quality assurance, IT and production. Especially the inclusion of production employees has shown itself to be important, because their immense knowledge could be used. In addition, they took part in designing the new processes/technologies and operational concepts, and will, because of this, embrace the planned innovations. Our parts of the consulting team were a senior consultant, a project engineer and additional engineers from the areas piping design and automation. Based on the block diagram, this team gradually developed each area into a PI diagram. These PI diagrams were stepwise refined in further detailed talks with the IpronaAG. During this planning phase, the aim was a well-defined description of the processes and not the specification of components (width, manufacturers, etc.). For partial areas, different operational/automation concepts were elaborated, presented, collectively discussed, reviewed and decided on. In the area of the juice tank storage this led from the initially favoured valve cluster solution to a complex, but still user-friendly solution using a vertical piping alignment. Already in this early phase we used our 3D CAD tools to present matters, which has proven to be very useful. Especially with the users of the future plants, the recognition value of their procedures was very high. Part of our consulting scope was a basic 2D piping alignment planning. Planning was done for all media, to avoid collisions of the pipeline routes. The rough planning ended in the generation of an offer for the planned scope. At this consulting phase, the order for realisation was given to Ruland. The Iprona AG processes fresh fruit as well as frozen fruit, which are first processed to so called ‚mother-juice’. The fruits are pressed and then treated in further steps to clear or naturally cloudy juices, before they are short-term heated and stored in sterile tanks with 30 m³ capacity. The range of the initial materials is quite varied, from honey melons and forest berries (strawberry, blackberry, currant, etc.) up to elderflowers. The mother-juice can be concentrated in two different plants. Both a thermal concentration plant and a cold concentration plant are used. 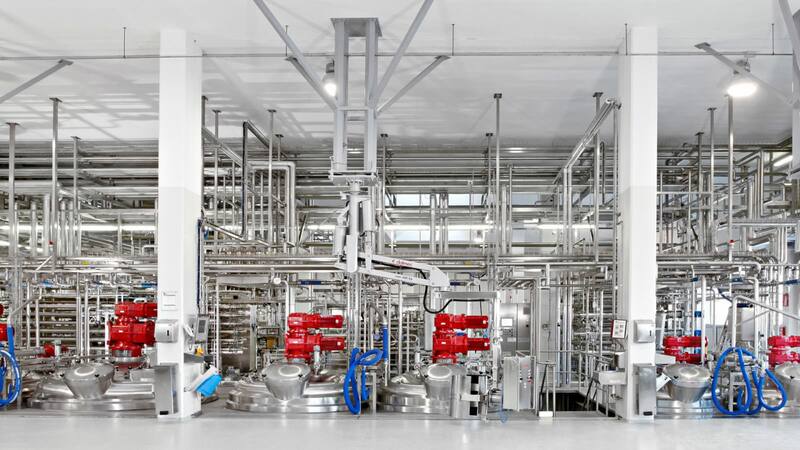 At the finished product lines, the main products like pulp-, puree- and juice concentrates, with or without fruit pieces and -components, can be mixed according to individual customer wishes in mixing tanks of varying size, pasteurised in diverse heat exchangers and filled aseptically. Ruland was responsible for all production areas: starting with juice generation, the juice tank farm, the inclusion of existing concentrate plants, up to the finished product lines and the CIP-supply of all plants. To ensure an ergonomic operating height, the mixing tanks were lowered to an intermediate floor. The use of coaxial agitators in the mixing tanks ensures a homogeneous batch for the following continuous pasteurisation processes. To allow for maximum flexibility, depending on batch size and product needs, either plate- or scraping heat exchangers can be included in the process. Whichever is chosen, the resulting route is leakage-proof, so on parallel or crossing ways other production or cleaning may take place. This flexibility is also seen to when filling bag-in-box, bag-in-drum or stainless steel transport container by using sterile valve clusters. Within a single batch, switching to another filling system can be done without effort. For the cleaning of the production plants, Ruland built two central CIP plants. Finished product lines and juice generation are hereby strictly separated, carry-over is eliminated. This sees to the high quality demands of Iprona AG. Using a matrix, the complete 13 cleaning circuits were distributed in such a way, that overlap in the individual areas was minimised and production efficiency maximised. The most economically sound way in this area was reusing existing tanks by retooling them for use in a CIP plant. In addition to those areas, Ruland implemented a concept to use energy from water vapours that stems from the thermal concentrate plant. To control the complex processes and to operate them in a unified way, Ruland recommended the use of a control system. 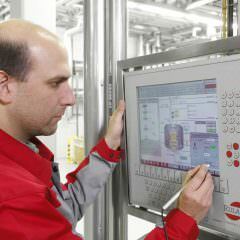 At Iprona, the Siemens-developed process control system PCS7 is used and combined with a Ruland-developed MES system, which bridges the PCs with Ipronas ERP system. 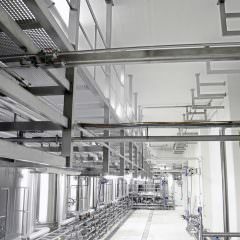 All necessary data is imported from the ERP system, transformed into production recipes by the MES system and then put into the process control, together with the corresponding production- and cleaning parameters, which are tailored individually to the various products and stored in diverse recipes. In addition, all components from subcontractors, which have an individual automation, are integrated into the control system via a common interface, developed by Ruland. For the plant operator, this concept allows for a common operation and supervision of all plant units. Insular automation solutions, differing in design and functionality, requiring a constant paradigm shift in the mind of the operator, are hereby avoided. Those are completely absent from the whole plant. As the Ruland system consists of building blocks for process control, recipe- and order management as well as batch traceability, the whole production process is always transparently reconstructable, all the way from the operators up to the company executives, and the real efficiency of the production plant is visible. From the order management and batch traceability in the control room up to sensor and actor in the field, a unified automation solution results – from a single source. On five building levels more than 50 km piping was installed. Due to this complex spatial situation, the whole project was designed in 3D. This in addition to an early and permanent installation monitoring by our project engineers allowed for piping installation optimised both from a process engineering view as well as to product loss. By communicating very closely and cooperative association of the project team and the people responsible at Iprona and Ruland we realised a very large, complex project in an extremely effective and successful way. Would you like to know more about process technology?